By 1917 the war was into its fourth bloody year and the great armies of Europe had ground to a miserable halt on the western front. The third battle of Ypres or “Passchendaele” as it came to be known, was an attempt by the allied forces to break this deadlock and to push through to the submarine bases on the channel coast. The battle lasted the better part of three months and saw the front move back and forth just a few costly kilometers. In 1917 Passchendaele was probably the most frightening place on earth (and frankly it had some stiff competition). 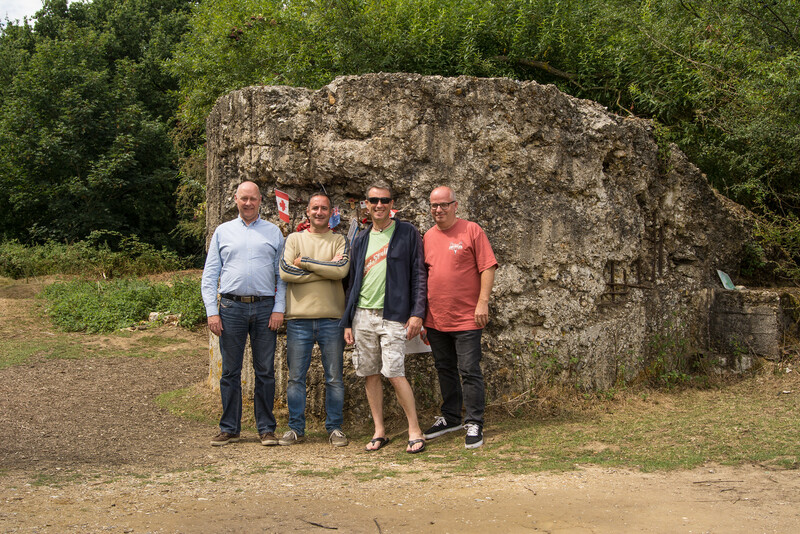 It was the obvious choice for my 2017 WW1 centenary visit and so on July the 30th, the day before the centenary I pointed my car towards Belgium and met up with my old chums Neil, Julian Mark and MT. 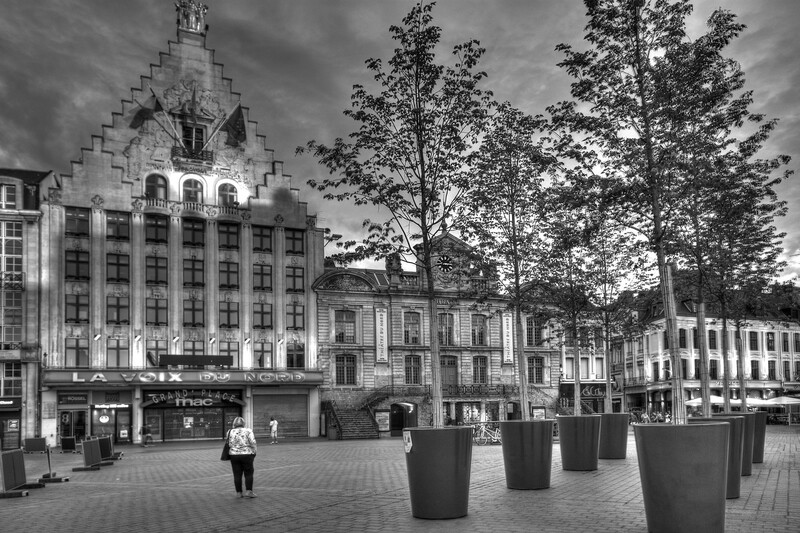 The market square in Ypres had been turned in to a massive theater for the evening. 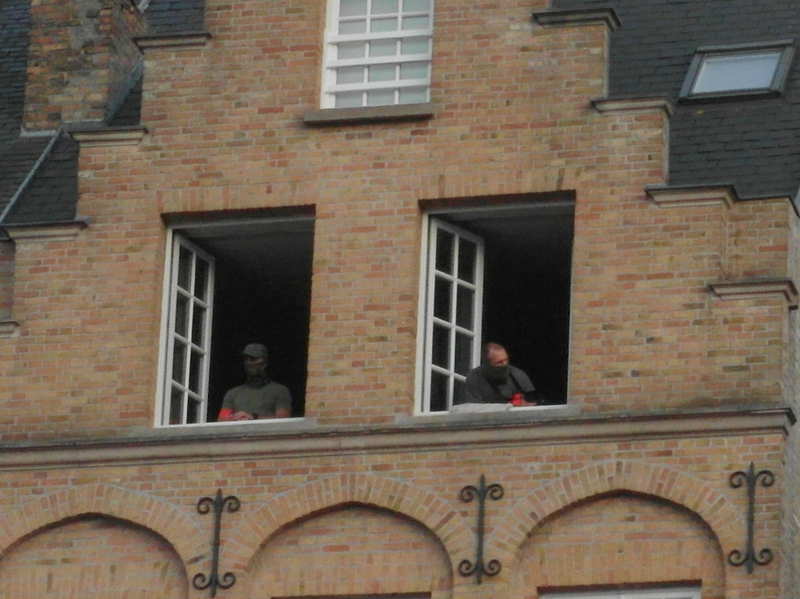 Airport style security checks were in place and from vantage points high above the square, tough looking men with balaclavas and guns looked out over the crowd. We had some time to kill before things got going so we browsed gift shops full of books, shell cases and all sorts of poppy themed souvenirs. 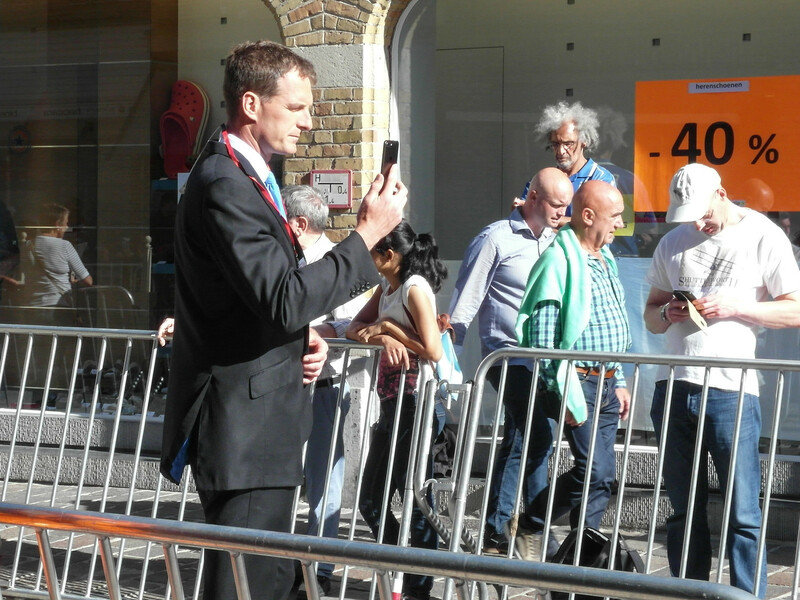 Close to the Menin Gate we walked past celebrity historian Dan Snow who was on speakerphone having some facetime with his kids. It was quite sweet actually – the 21st century equivalent of the letters from Ypres that British visitors would have sent back to Blighty 100 years previously. 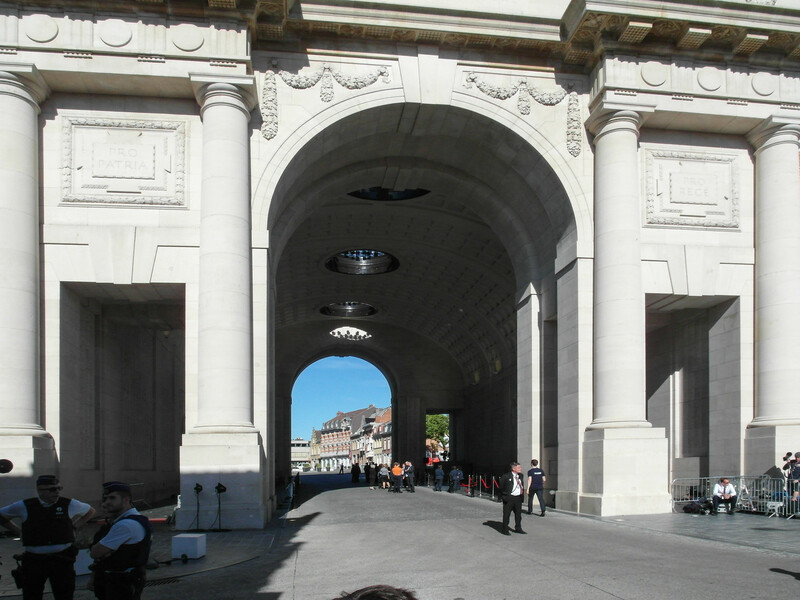 Every evening at 20:00 the road that passes through the Menin Gate is closed and a short ceremony of remembrance is held. Usually the famous verse of Laurence Binyon’s “For the fallen” is read out and the last post is sounded by members of the Ypres volunteer fire brigade. Sometimes a visiting school class, a boy scout troop, or a branch of the British Legion get to participate. The impressive thing though is that the ceremony goes ahead day after day, even on the dreary winter evenings when only a handful of visitors huddle to escape the worst of the wind and rain. Today was very different of course and actually the monument was out of bounds to the general public. 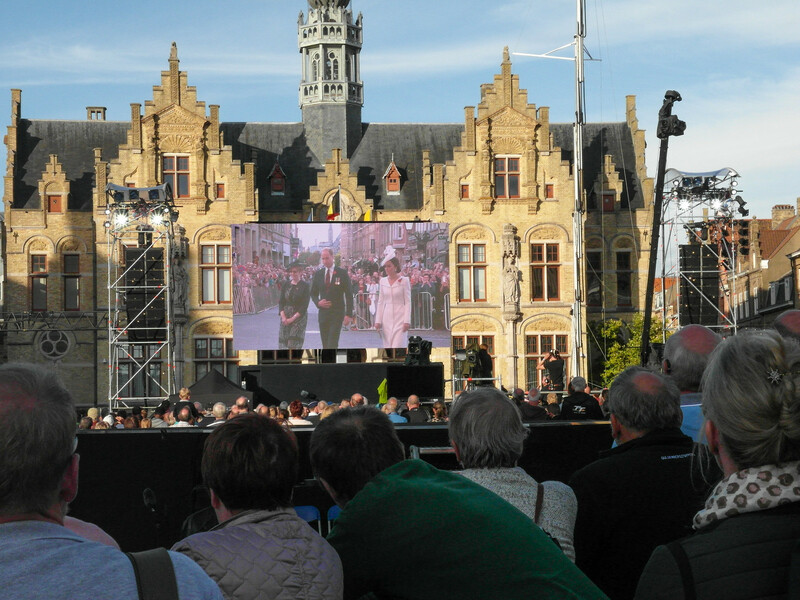 We did get to watch the ceremony on large video screens in the market square as Prince William and his lovely wife laid wreaths alongside the King and Queen of the Belgians. Was it my imagination or was there an audible groan from the crowd as Therese May came into view curtsying and trotting along behind them? After the ceremony at the Menin Gate, the VIPs took up their places in the square and we were all treated to a very moving show courtesy of Helen Mirren, Ian Hislop, Michael Morpurgo and numerous other famous people who’s names I either cannot remember or never knew. 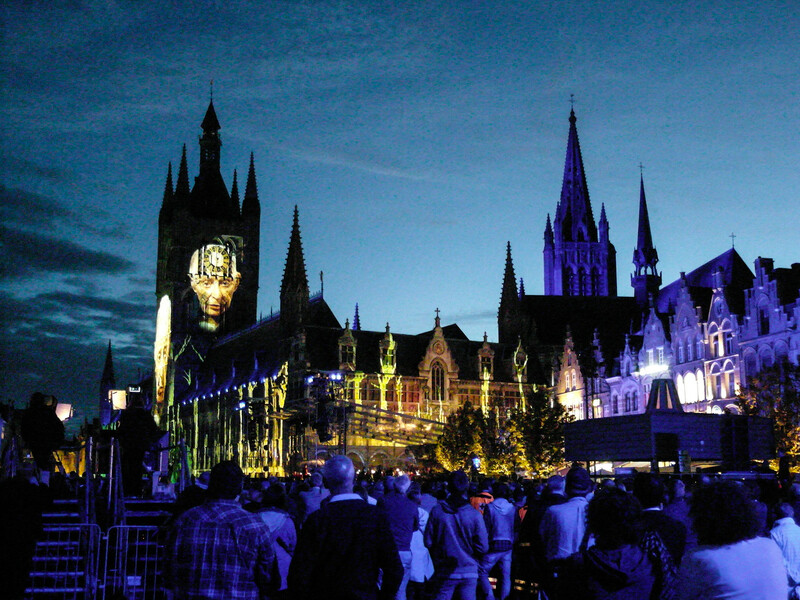 The walls of the Cloth Hall were used as a giant screen for the best AV show that I have ever seen. Check out Harry Patch on the clock tower! 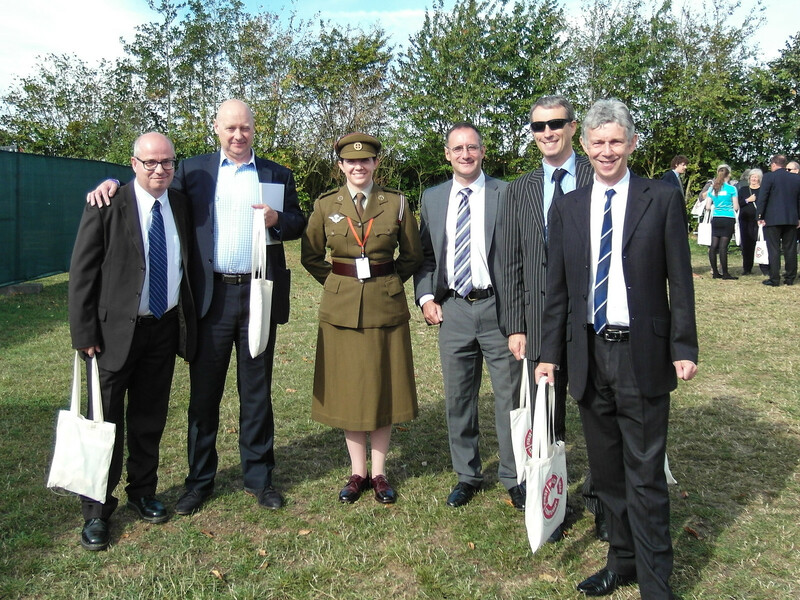 When we visited the Somme in 2016, and Gallipoli the year before that, we couldn’t help noticing that the best places at the various commemorative events were reserved for invited guests and ticket holders. 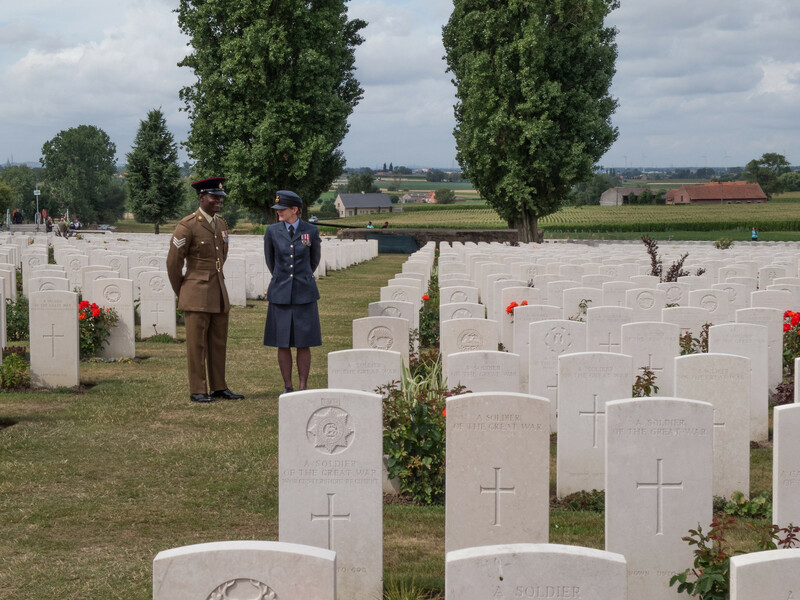 This year we had done our homework and had managed to get tickets for the official ceremony at Tyn Cott military cemetery We were very excited, especially as the documentation we had received mentioned complimentary rain capes and light refreshments! The organizers were true to their word and at 10:00 on the morning of the 31st of July, we found ourselves drinking tea, eating croissants and posing for photographs in an assembly area close to Zonnebeke. 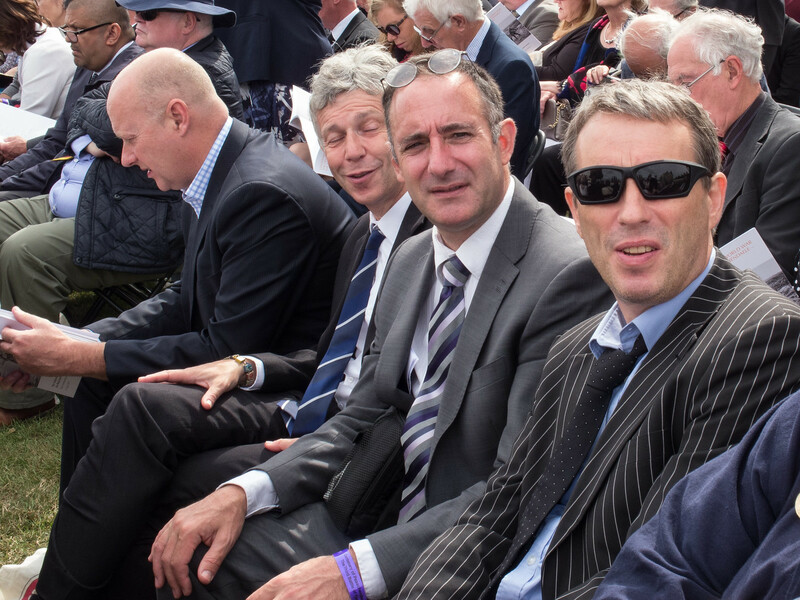 Not long afterwards we were bused in to Tyn Cott with a couple of hours to look around before the Royals arrived. Tyne Cott is a magnificent but rather sombre place. It is the largest CWWG cemetary in the world with 11,965 graves. 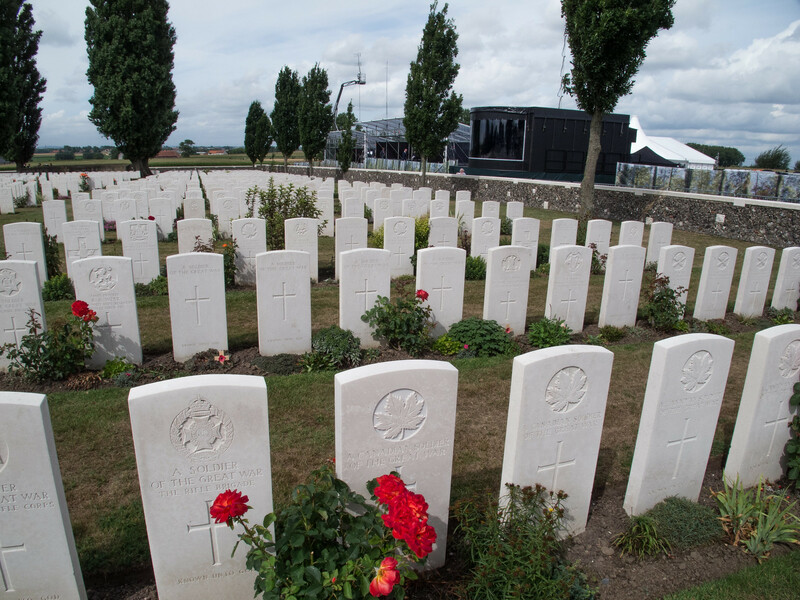 11,960 of these are for soldiers from the British Empire but there is also one French and four German graves. I have visited several times – usually in the rain (which I find suits it best). This morning there was quite a party atmosphere! We had been instructed to wear lounge suits (I had to Google it) and were encouraged to wear our fallen ancestors medals. I had no bemedaled ancestors and I would have felt a bit weird wearing their medals even if I had. Many of my fellow guests had no such reservations. 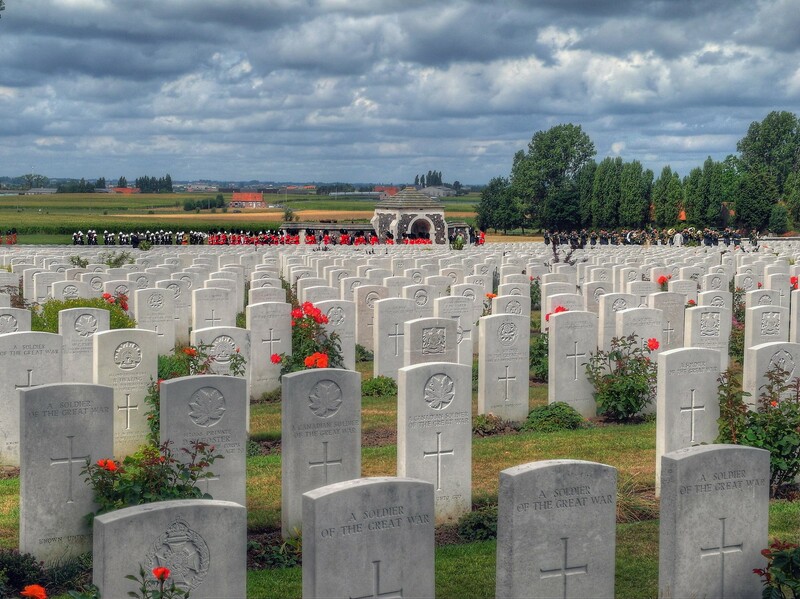 Small children played among the graves with rows of medals jangling on their tiny chests. Again, YouTube has a video of the whole event…. In a suitably sombre mood the pals walked the mile or so back to the assembly area in Zonnebeke (we didn’t like the look of the bus queues which snaked their way round two sides of the cemetery). 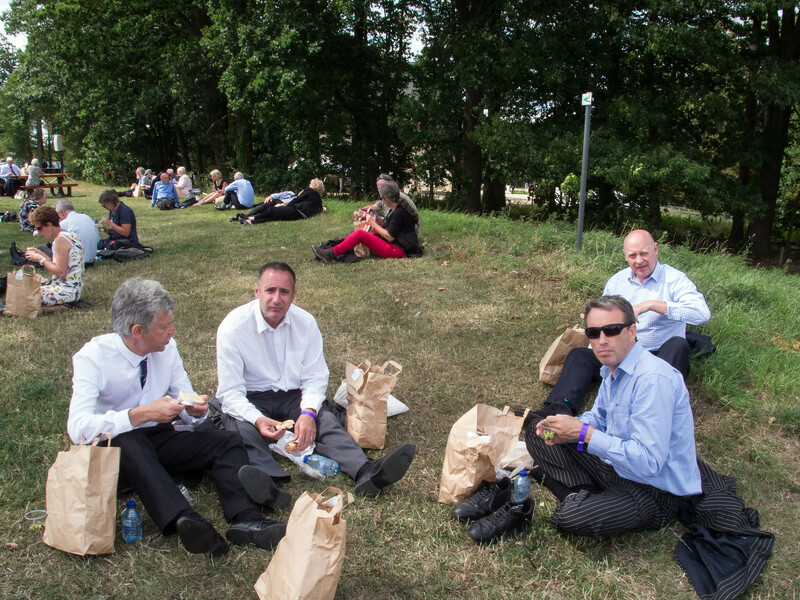 We were delighted to find gratis packed lunches waiting for us. They included ham and cheese sandwiches, drinks (non alcoholic), rather a nice mini quiche and a pot of fruit joghurt! We retired to our AirBNB for a snooze then took a trip to Lille for a very agreeable meal. I had Pate, Steak Tartare and Jupiler beer in case you were wondering. The following day we visited some of the battlefield sites in the area. 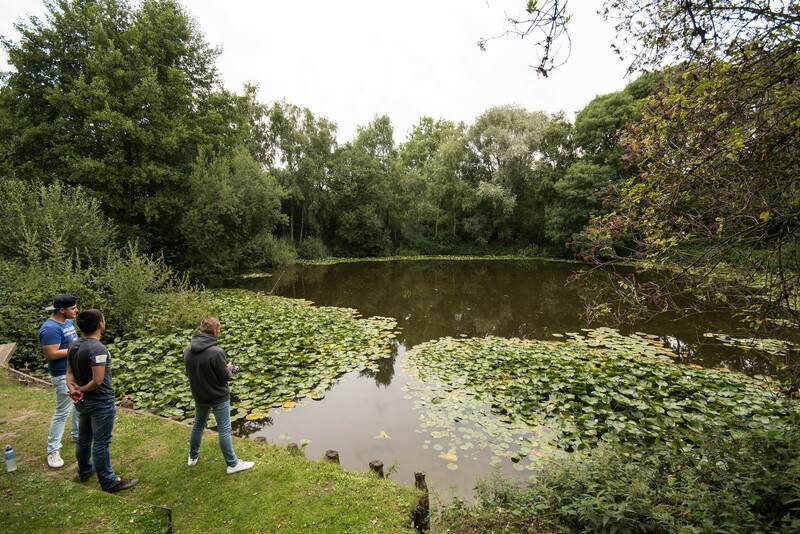 The first was Spanbroekmoelem Pool of Peace – an ironically named pond formed in the crater left by the explosion of at enormous mine exploded at the start of the Battle of Messines. 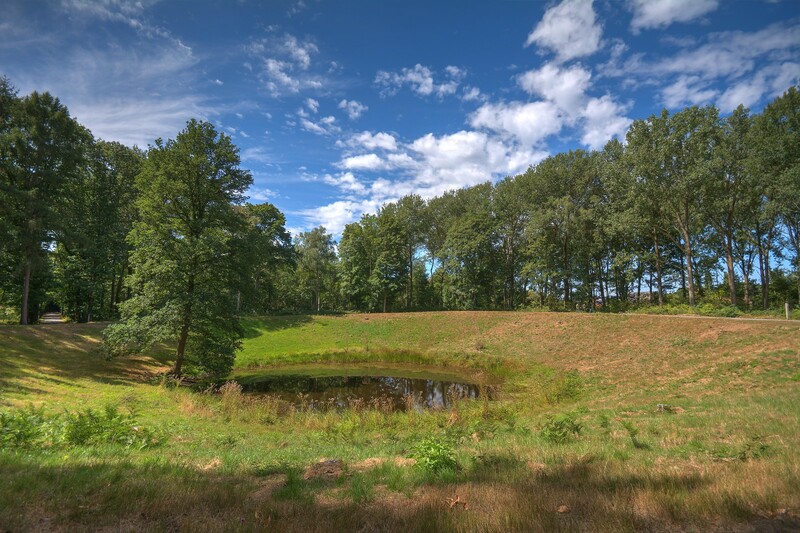 The Germany army were dug in along the Messines ridge south of Ypres. Keen to dislodge them, the allies spent six months tunneling under the ridge and on the 7th of June 2017 they lit the blue touchpaper and ignited 90000 lbs of high explosive under the German positions. The bang was apparently heard in Downing Street and in Dublin. At that stage in a very noisy war, it was thought to be the loudest ever man made sound. When we visited some local youngsters were fishing using cigarette butts as bait! They were getting bites but I didn’t see them land anything. 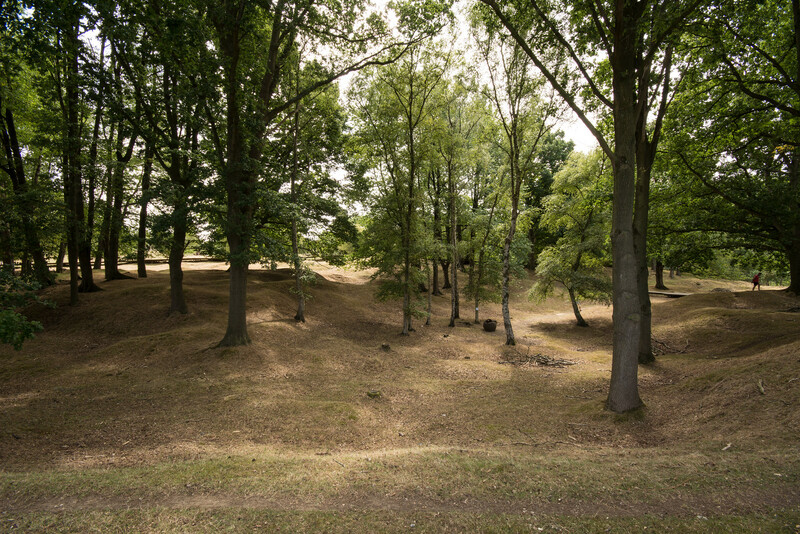 After Spanbroekmoelem we headed to Hill 60, This battlefield had been the scene of fighting for much of the war and was also one of the locations mined and blown up as part of the massive firework display on the morning of the 7th of June 2017. You can pick up a crate at the monastery if you phone and make an appointment in advance. You can only buy two crates at a time and you cannot return within 90 days. I have phoned a few times as I pass by the brewery a couple of times a year on my way to England but I have never got through. The other way to try the beer is to visit the “In de Vrede” cafe opposite the monastery. There you can buy the beer by the glass and sometimes in six packs in their gift shop. 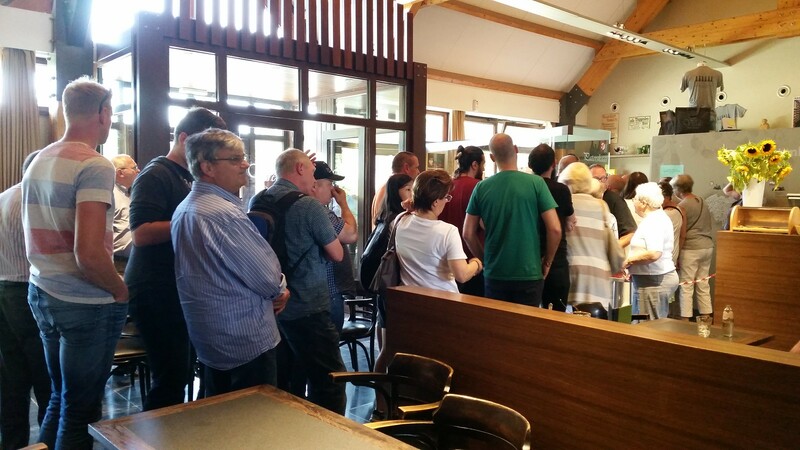 When we arrived there was quite a queue for the gift shop. Apparently all three beer sorts were available. Grown men were leaving the store carrying boxes of beer and giving each other high fives. I joined the end of the queue and about half an hour exchanged 45€ for two six packs of Westvletteren 12 (customers are limited to two packs each). I cannot wait to try it! Check back here next November for the final installment in my centenary series. I haven’t completely decided where it will take place but wherever it is, I am sure that Prince Charles will be hot on my heels!